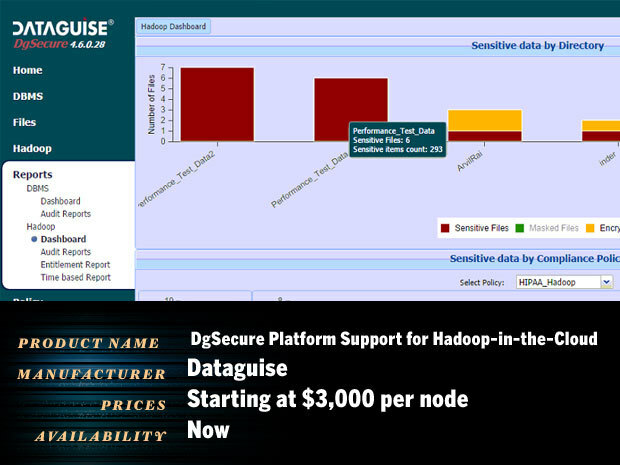 Key features: Dataguise’s DgSecure platform now supports Hadoop-in-the-Cloud, including cloud Hadoop implementation, Amazon EMR, making Dataguise the only vendor that supports 100 percent of the major Hadoop distributions along with Hadoop-in-the-Cloud, traditional databases, files and SharePoint. Big Data cloud service providers, Altiscale and Qubole are leveraging DgSecure to provide protection to sensitive data for Hadoop customers. More info.